On Tuesday 25 July, the Nuon Solar Team presented their latest solar car, Nuna9. The new version has been reshaped and features a smaller solar panel. In October, the team of TU Delft students will travel to Australia with Nuna9 to defend their world title at the World Solar Challenge. Up until now, the details of the solar car have been kept secret from the competition. Team captain Sander Koot: “Nuna9 is revolutionary. The shape of the car is completely different to our previous solar cars. We wanted to keep this new shape a secret for as long as possible to avoid letting the competition more into the know than they already are. In recent years, the gap between the different teams during the race is steadily narrowing. We often also see elements of our earlier solar cars reflected in what other teams enter into the race. And it is naturally important to us that we once again bring home the world championship title this year.” That is why the TU Delft students are keeping the inside of the car away from prying eyes. “We don’t want to go giving them ideas!” chuckles Sander. After winning the race on multiple occasions and as the reigning world champion, the Nuon Solar Team is the clear favourite to take home the title in Australia. The organisers of the race are now using the slogan ‘Take on the Dutch’ to challenge teams from all over the world to try and beat the team from TU Delft. To symbolically express their winning mentality, the team has decided to mount a lion’s mane on their solar car. “The mane radiates strength. The larger the lion’s mane, the stronger and more invincible he is. The lion’s mane is also symbolic of Dutch pride and glory,” explains Sarah Bennink Bolt, a member of the team. 9: Nuna9 s the ninth solar vehicle built by the Nuon Solar Team. 135 kg: the weight of Nuna9. 30.3%: Nuna9 is a good deal smaller than the previous solar car. 2.64 m2 is the surface area of the solar panel. 20 kg: the weight of the battery. By way of comparison: the battery in a passenger car weighs 540 kilos. 3: this year, female drivers will be behind the wheel. all solar vehicles built by the Nuon Solar Team bear the ‘player’s’ number 3. 3,000 km: the race in Australia starts in Darwin. The solar vehicles subsequently race 3,000 kilometres across Australia, working their way to the finish line in Adelaide. The race starts on Sunday 8 October, and the winner is expected to take the chequered flag as early as Thursday 12 October. 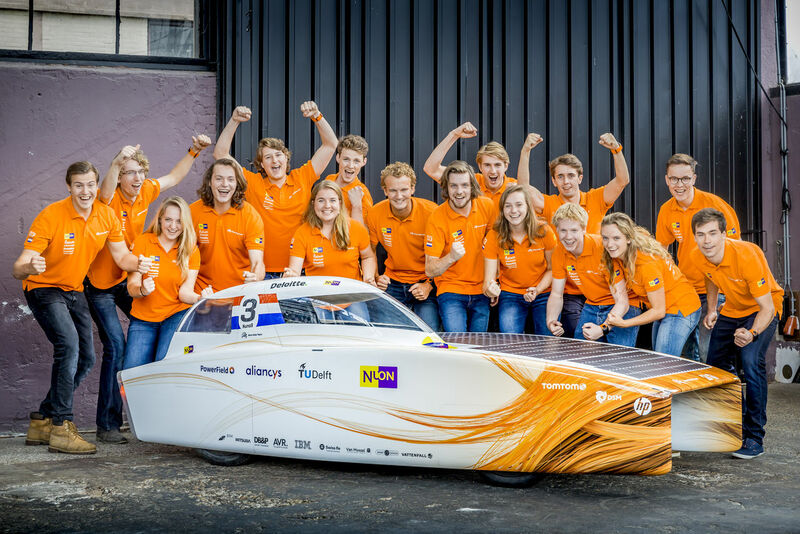 This year’s Nuon Solar Team comprises sixteen students. In October 2017, they will defend their world title during the Bridgestone World Solar Challenge with Nuna9, their self-built solar car. The TU Delft students have won the race a total of six times, including the last edition of the race in 2015. Covering more than 3,000 kilometres, the ‘track’ stretches across Australia, from Darwin to Adelaide.